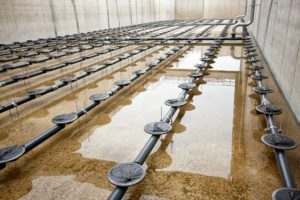 Proper mixing within anoxic and anaerobic MBBR zones can improve the bioorganic nutrient conversion processes, minimize operational footprint, reduce energy costs and improve water treatment efficiency. 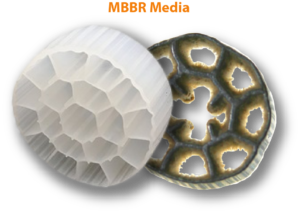 The Moving Bed Biofilm Reactor (MBBR) or IFAS (Integrated Fixed-film Activated Sludge) technologies are now more commonly used to maximize the efficiency in treating wastewater from industrial applications that produce high concentrations of BOD, COD and TSS. This newly adopted technology has become more efficient than traditional biological wastewater treatment processes capable of achieving nearly complete nitrate/nitrite-nitrogen (NOX-N) reduction. It also reduces water treatment plants footprint by minimizing stages previously required to filter BOD from biosolids. In short, MBBR is a highly effective activated sludge process and bio-filter process that uses small Biofilm carrier elements or “media” (polyethylene) to aid in biofilm growth. These carriers have density lighter than water and tend to float causing “rafting” – they must be kept agitated within the reactor tank basin for optimal interaction with bio-solids to allow biomass or biofilm/ bacteria to attach onto carriers transporting nutrients and oxygen thus producing faster biological results. Mixing inside MBBR reactors can be challenging as not to damage the media carriers but still maintain a balance between suspension and axial movement. Anoxic Reactors use slow speed mechanical mixers equipped with VFDs to maintain greater pumping control. Aerated Reactors maintain movement by using Media Retention Screens and Aerator Grids equipped with air diffusers that provide oxygen to induce bacterial/biofilm growth and uniform reactor mixing. Aeration Reactor tanks using proportionally positioned grid diffusers shows consistent water velocities with four distinct rolling patterns within the reactor – however airflow pressure for adequate mixing are calculated with aeration grid configurations at times falling short of providing sufficient pumping to create a model capable of stimulating the movement of media. Although these aeration systems are great for oxygen dispersion, they are not ideal for mixing reactor tank basins. Disproportionate aeration grid configurations and the complex physics involved in mixing are far too great to overcome. For example, diffusers need to be replaced; airflow adjustments need to be made, sieve cleaning and grid reconfigurations or add-ons need to be considered. In many cases mechanical mixers complement Aeration systems by increasing oxygen transfer efficiency and nutrient uptake through precise mixing. 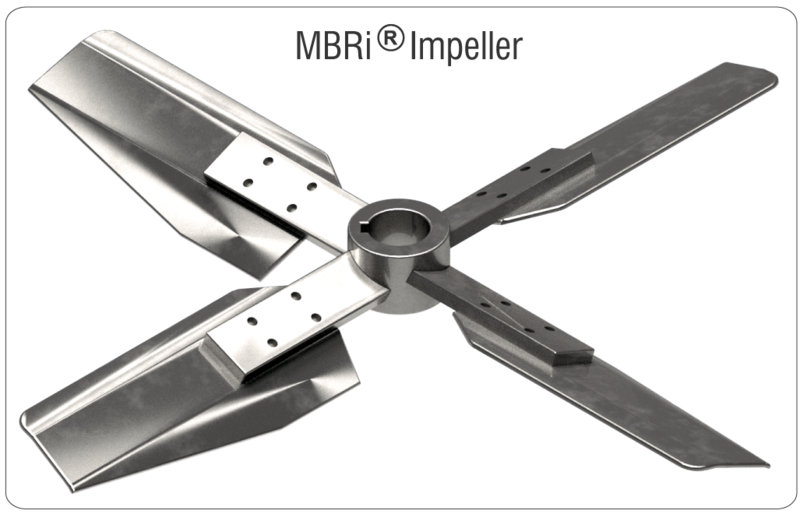 There is a notion that diffusers should be used in Aeration Reactors to avoid carrier-biofilm damage but this is common with poorly designed mechanical mixers which are not designed for the MBBR process. The concern is that damaged media shards will flow into the membranes in subsequent stages and dislodge biofilm. Therefore Dynamix employs lower-shear mechanical agitators/mixers to address the challenges of anoxic process control or low-shear in aeration reactors. Because plastic biofilm media float in quiescent water, our mixers can be configured to reduce rafting and dead zones, while still controlling the above challenges. At Dynamix, our objective is to understand challenges in water treatment processes; chemical dosing, and operating practices, and provides highly customized mixing equipment that will optimize process time and chemical consumption, while minimizing energy usage. For more information on all Dynamix mixer lines, visit our Product page.